Astrobe is a fast integrated development environment for Windows. 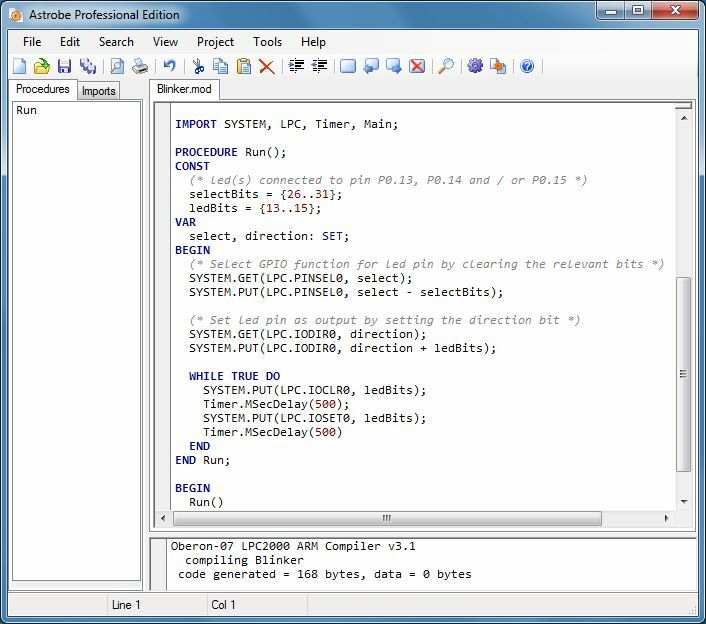 Develop efficient 32-bit native code embedded software forARM microcontrollers. You can now write high- and low-level software without assembler or C. Astrobe Features include interrupt programming, register parameters, advanced data structures and floating-point maths. Includes source code of applications to read / write SD cards, EEPROMs, Flash, temperature sensors, compass etc. Astrobe Features include interrupt programming, register parameters, advanced data structures and floating-point operations. Includes source code examples of applications to read / write SD cards, EEPROMs and Flash ROM; 7-segment LED displays, temperature sensors and a digital compass. Qweas is providing links to Astrobe 3.2.2 as a courtesy, and makes no representations regarding Astrobe or any other applications or any information related thereto. Any questions, complaints or claims regarding this application Astrobe 3.2.2 must be directed to the appropriate software vendor. You may click the publisher link of Astrobe on the top of this page to get more details about the vendor.